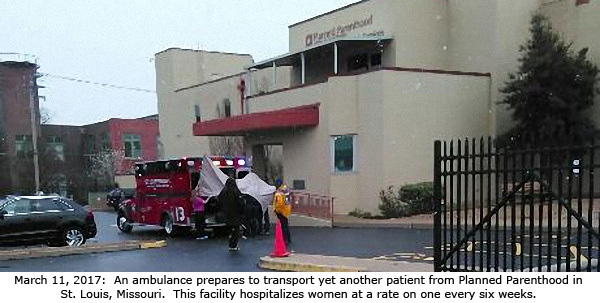 St. Louis, MO – The most dangerous abortion facility in America has transported its 64th known patient by ambulance to a local hospital on March 11, 2017. The high-volume Planned Parenthood in St. Louis, the only abortion facility in Missouri, has a dismal abortion safety record. Fire Department Records and eye-witness accounts show that it uses emergency ambulance transports for patients on average of once every six weeks dating back as far as 2009. One witness to the most recent March 11 incident told Operation Rescue that lights and sirens announced the ambulance’s arrival at Planned Parenthood around noon. Ten minutes later-paramedics emerged from the abortion facility with a woman on a gurney that was completely “cloaked” while clinic workers deployed tan tarps to prevent pro-life activists from documenting the incident. It left without running lights and sirens. “We are seeing increasingly deteriorating facility conditions, infection control practices, and patient safety issues. I can imagine no other business that would be allowed to endanger the lives and health of its customers to the extent that this Planned Parenthood abortion mill has,” said Troy Newman, President of Operation Rescue. Despite its inability to keep its abortion patients out of the emergency room, Planned Parenthood has sued Missouri with the intent of disposing of important abortion safety laws so it can expand its shoddy services into other Missouri communities. Nationwide, safety at Planned Parenthood abortion facilities is no better. Yet, Planned Parenthood continues to receive over $500 million in taxpayer funds each year. America must stop subsidizing Planned Parenthood’s shoddy businesses. Please contact your Congressman and Senators and demand that they immediately defund Planned Parenthood.